The medical community has become increasingly aware of the detrimental effects of sitting for long periods of time, a practice all too common among office workers who spend their days parked behind a traditional workstation desk. Many people spend several hours each day seated with little to break the monotony besides the occasional stroll for lunch, conference room visits and water cooler chats – and it’s taking a toll on the health of Americans. More than a third of American adults are obese, according to the Centers for Disease Control and Prevention, and a major contributor to this epidemic is the sedentary lifestyle that has become the norm . It’s common for a person to spend half of his or her waking day seated, generally behind an office desk, and the other half engaging in low-impact physical activity, such as cleaning and walking. 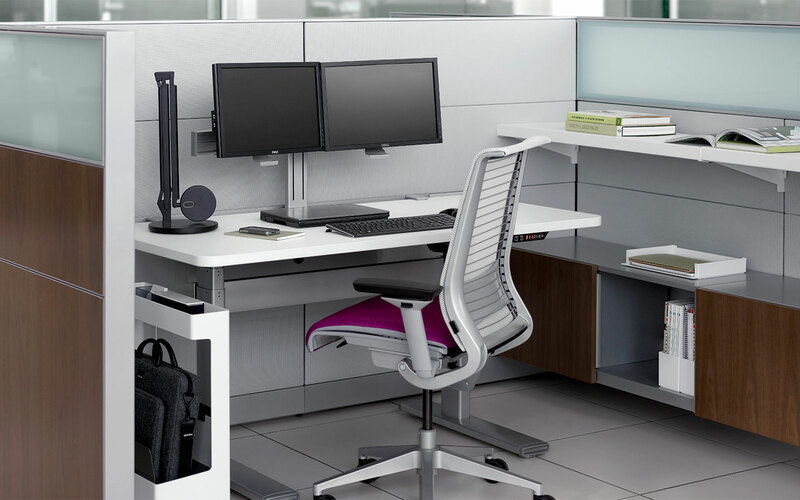 Office Designs carries the Steelcase Series 7 adjustable height desk that lets one go from sitting to standing in seconds. Humanity has reached a pinnacle of physical inactivity, and even hitting the gym regularly can’t offset the effects excessive sitting can have on body weight. As the Mayo Clinic suggests, the key to reducing obesity rates among Americans is to sit less and move more, which can be as simple as standing whenever the chance presents itself. After all, the muscle activity involved in standing activates metabolic processes associated with the breakdown of fat. The sit-to-stand desk can contribute to this solution, as it can effectively reduce the amount of time that a person is seated each day. Keeping in mind that a sedentary lifestyle significantly increases the risk of obesity, sitting for too long can also lead to a wide array of associated cardiovascular complications. As the CDC explains, obesity can increase one’s chances of Type 2 diabetes, heart disease, stroke and other cardiac events that can prove to be deadly. In addition to the toll on life quality, there are great fiscal costs too: Annual medical expenses were more than $1,400 higher for an obese patient than one of normal weight, according to the CDC. These are all preventable complications that can be avoided with weight reduction and a more active lifestyle. Through promoting weight loss by encouraging people to stand, the sit-to-stand office desk has the potential to reduce the risk of cardiovascular illnesses. The sit-to-stand desk clearly has a wide array of health benefits, but it may also help improve employee performance. Standing enhances circulation throughout the body, which not only provides heightened levels of energy – but it also improves mood (the reduced back, shoulder and neck pain may also have something to do with that). In fact, the CDC recommends sit-to-stand office desks for this reason, among others. Standing also increases blood flow to the brain, which fosters greater cognitive ability and can spark creativity among workers. 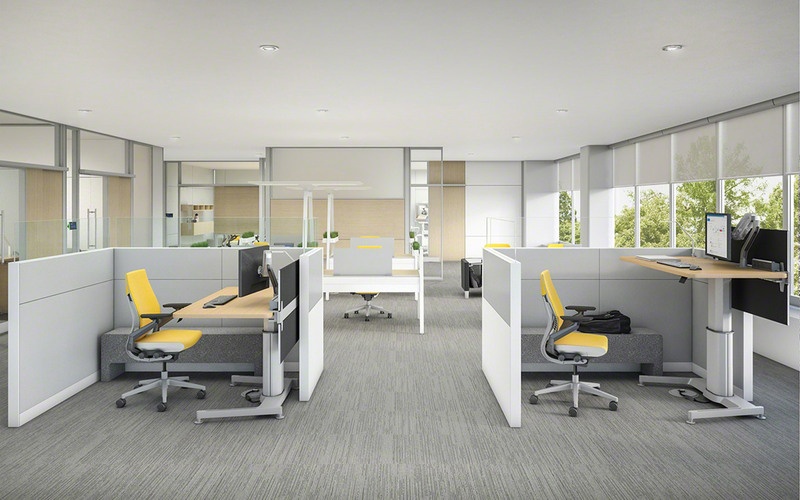 The Steelcase Series 7 adjustable height desk can help promote productivity in the workplace. 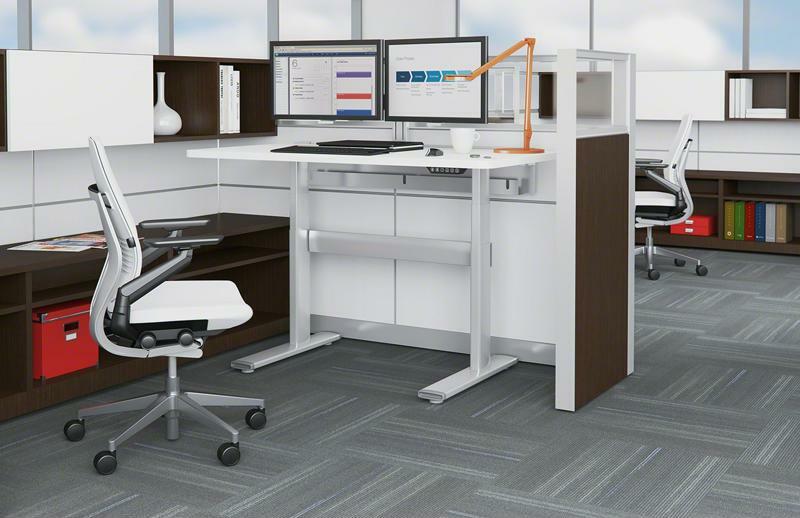 The sit-to-stand desk has numerous benefits for the employee and, in turn, can be a rewarding investment for the employer. There is massive potential for ROI – in general, for every dollar companies put into ergonomic strategies, they see a return of nearly $18. 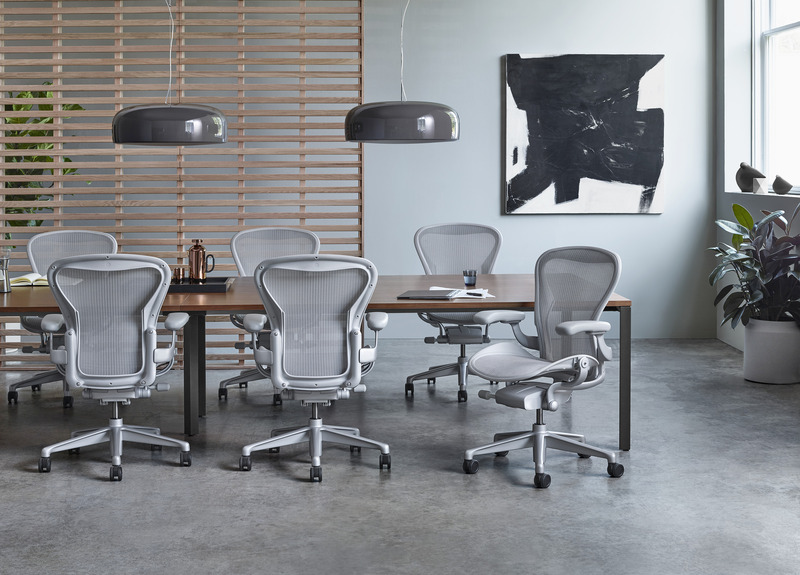 Office Designs has multiple sit-to-stand options, including the the Steelcase Series 7 Height Adjustable Table and the new QuickStand by Humanscale. An office planner can work with you to help you choose the best product for your office’s needs and layout.